OMG Posters! 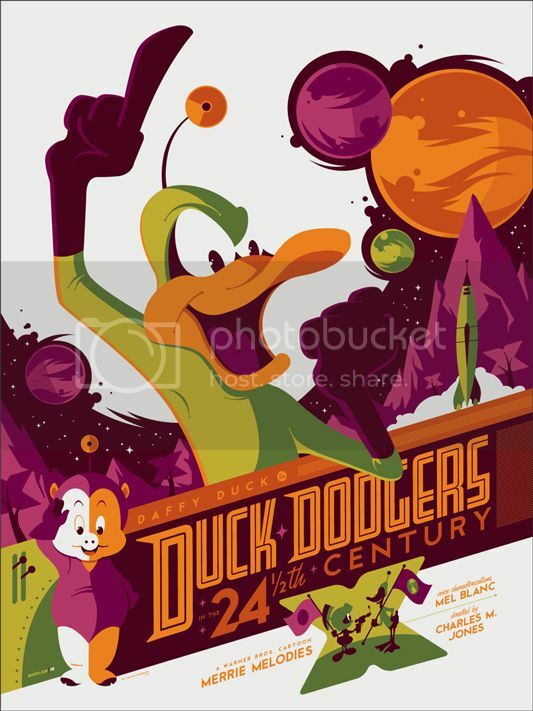 » Archive "Duck Dodgers in the 24 1/2 Century" Art Print by Tom Whalen (Onsale Info) - OMG Posters! Mondo will release copies of Tom Whalen’s “Duck Dodgers in the 24 1/2 Century” poster today. It’s an 18″ x 24″ screenprint, has an edition of 320, and costs $40. It goes up today (Friday, April 13th) at a random time. Visit Mondotees.com. Gotta disagree his style kills on these animated posters. Plus you know its nice for those people who have kids, a cool poster that is kid friendly. I’m glad Whalen’s found his nitch I emailed him a few years ago with a question and he was a real nice guy. They also dropped the Edgar Wright, Tong poster and a Dune poster today. Anyone catch that? Managed to grab the Dune poster. Didn’t see the others. @rabbit – what are you talking about? Enough using “Da” in place of “The” already! Great work. Just not my cup of tea. Any idea when we’ll see another DC print? @kotapa4 at like 10:30ish this morning they had the Edgar Wright triple feature Tong print up and a Killian Eng Dune print. They were unannounced and sold out somewhat quickly. Go check eBay if you want to see what I mean.